FREE with thanks to the City of Victoria! Wear shoes you can pivot in-- no sticky rubber soles. No partner needed. Argentine Tango is a social dance-- a walking hug-- to lovely orchestral music from the 1930s - 1960s. In an over-digitized world, to come into a partner dance in a warm and friendly community is a very welcome shift. It's true what they say: Tango is the dance of love. Come and discover its charms, all for free. 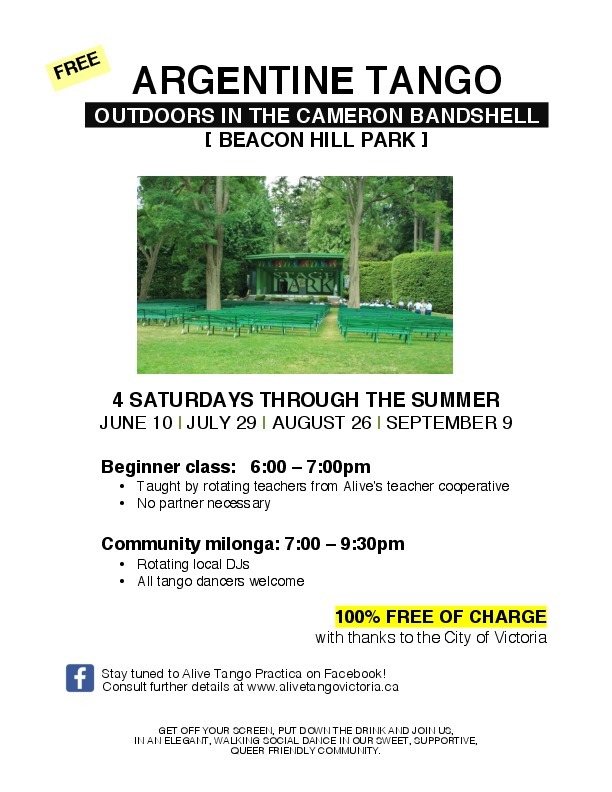 This is the first of four free opportunities this summer in Beacon Hill Park. 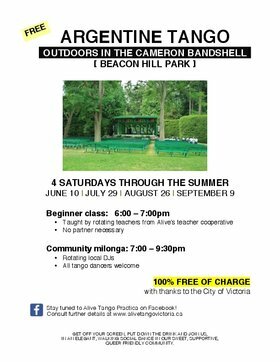 If you fall in love with tango you can join our Beginner classes every Sunday, 7:00 - 9:00pm at Martin Batchelor Gallery on Cormorant St. in downtown Victoria.